In this two parter post, I've already covered off what I've taken out of my face routine after a quick chat with Caroline Hirons. Now I'm going to talk about what I've introduced after going through her recommendations and thinking about what my skin needs. Some of these are completely new introductions, others are things I've actually been using for a while, and others ar re-introductions of things I've had lying about unused. 1. Clinique Take The Day Off Balm. This was described to me as a pot of grease, and frankly, that's what it is. It's like a cross between a more face-friendly Vaseline meets a giant tub of emulsifying ointment which you might have encountered if you suffered from eczema. I've been using this as my 'first' cleanse when I'm back in from work or a day out. This has taen the place of my micellar water and my original first cleanse (which in recent months was the Chantecaille Rice and Geranium Foaming Cleanser).It was odd at first using this to take my makeup off, and I'm still working on how much is the perfect amount to scoop out to cover my face in one go (who likes putting their hand back in when it's already covered in greasy balm and makeup? )However, despite the initial weirdness in routine change, I've switched over fairly well and find it almost fun using the TTDO balm to remove makeup. The TTDO balm is pretty inoffensive stuff being non-scented and just a white balm as described before, and though it might look a bit dull in the pot, the fact it liquifies makeup when you massage it in makes it kind of fun. I'm pretty happy with this switchup. 2. Clarifying toner. I've been using acid toners since I became interested in skincare, but never really looked that much into clarifying toners. I have had the REN Clarifying Toner but was happier using the Pixi Glow Tonic because I knew what that was doig. With a Clarifying Toner,it's aimed at fighting blemishes. As I'm dealing with blemishes, while having dehydrated and relatively sensitive skin, I think I will probably either use this once a day or alternate days. I have the Clinique Mild Clarifying Lotion Toner in my sights for when my bottle of REN has finished, mostly because it has Salicylic acid in for spots while still being gentle so that it won't dry my skin out. 3. Hydrating serums. I'm dehydrated. Give me hydration! I'm reintroducing Hydraluron for this simple fact, as well as looking into serums that give a hydration boost. 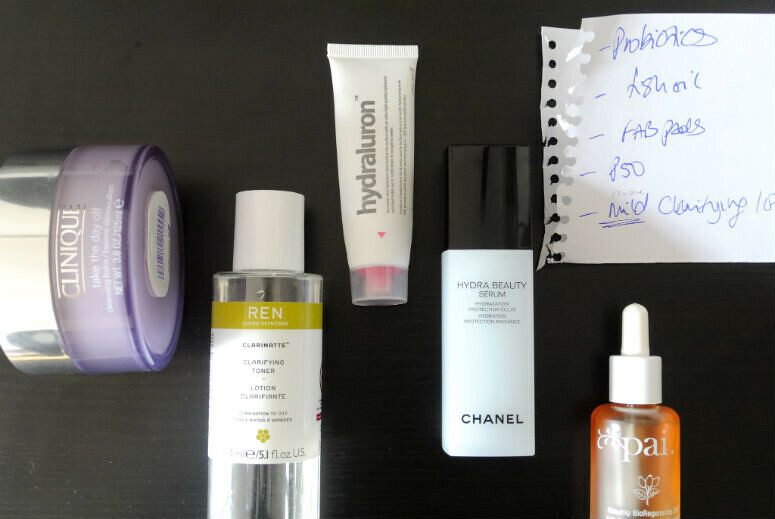 I alreaedy have the Chanel Hydra Beauty Serum, but I'm hoping to add the Vichy Aqualia Thermal Serum that was recommended by Sali Hughes in the Guardian (Escentual are due to have a 1/3 off French Pharmacy products beginning June, I might wait for that!). If anyone else has recommendations they'd be much welcome. 4. Light but hydrating moisturiser. The Clinique Moisture Surge moisturiser has been recommended to me, especially for day use, because it's a watery hydrating moisturiser that doesn't smother the face. I haven't yet added this into my routine yet mostly because I have a ton of moisturisers in my cupboard and can't quite justify chucking out the other spare moisturisers in storage, so in the meantime I'm using a large sample of the Clarins Hydra Quench moisturiser I received from an event at Harvey Nichols. 5. Targeted Spot Approach. As opposed to tackling my blemish problem with all-over solutions, I've decided to focus my blemish fighting with just one product in combination with clarifying toners. I've been using the Evologie Blemish Serum for some time for targeted approach and it's seemed very effective. I'll be dedicating a whole post to this product at a later date. 6. Oils. I've been using oils in my face routine for a while, including the Pai Bioregenerate Oil. This is one I'll be keeping up. I've also been meaning to get for the longest time the Clarins Lotus Oil, but since this is aimed at clarifying, I don't want to go overboard with the clarifying, so I will change this wishlist product to the Clarins Blue Orchid Oil. I've also had the Aesop Fabulous Face Oil for some time, which I've decided to reintroduce. This goes on surprisingly matte (unless you whack on loads that is) so I've been using this in the morning with a bit of moisturiser before makeup. 7. Vitamins. I already took omega oils as a supplement, originally starting off with Fish Oils, before changing to Flaxseed. I've been a bit lazy with these lately, mostly because I haven't gotten round to replacing my empty bottle. Personally I've found Fish Oil to be more effective than Flaxseed, so I'm placing my order for Fish Oil as I type. I'm still working on the tweaking towards a gentler and more hydrating routine without breaking the bank. I'm not expecting overnight results, but I'm hopeful that things will start making improvements now that I'm rethinking my skin approach.